Our fruit bowl has been looking a little strange lately. Since the Queensland floods we have hardly seen any bananas and never for less than $ 13 per kilo. This makes exotic imports like Mexican Mangoes seem cheap at only $ 3.95 each. 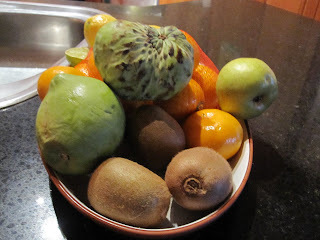 We've had pomegranates and persimmons, melons of three different kinds, mangosteens, paw paw and tamarilloes. We 've had passion fruit and fejoas and Aztec fruit (creamy white and slightly sweet, not unlike avocado in texture), custard apples and two kinds of kiwi fruit, but still no bananas. While fejoas have been a hit with the girls, they are getting tired of all this exotica and long for the fruit we used to take for granted. Anyway, on Friday to my delight there was a stall on when I went down to pick up one of the children from school. Nestled among the cupcakes and crafts, were some perfectly delicious looking pears. The trouble was that I hadn't brought my purse and didn't have a cent on me. When I asked the woman in charge if I could give my $2 to the office on Monday, she looked at me the way my bank manager does when I ask for a $ 5,000 cash advance. "No way, " she said, "We don't do credit. Besides the office doesn't like having to keep our money separate." What did she think I was going to do? Leave the country? There were only two lots of pears left when I came back down the hill with child in tow. Other parents had obviously seen them. I considered asking one of the other mothers for change but thought I might be making things look even worse for my daughter than letting the girls go to school in their self -chosen clothes. Still, I couldn't quite give up on those pears. By crawling around on my hands and knees I found $1.50 in change in the console (the parking money) and another forty cents among the flotsam and jetsam of textas, seaweed biscuits and socks on the floor. There was no way that the stall -holder was going to let me off on those last ten cents, knowing the PTA Mafia as I do. I could be depriving some child of a pencil. No, the pears hadn't all gone as you might expect. Occasionally some things go right.
" I knew you' d back," the lady said as she handed me the last bag of pears. She must have seen that murderous gleam in my eye and been too afraid to sell them to anyone else. Anyway, you'll be pleased to know that those pears tasted just as sweet and crunchy as they looked but you know what? I still wouldn't mind a banana.